Transforms hair to maximise strength for volume. For fine hair. Safe for colour treated hair.Fine hair lacks the protein necessary for strength, body & the power to hold a style. Weightlessly transforms fine hair from within. 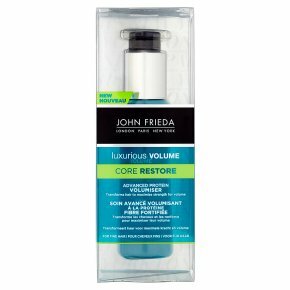 Progressively strengthens for long-lasting volume and natural-feeling style. Heat-activated volumiser, with Protein-Strength Complex. For best results, start with Core Restore Shampoo & Conditioner. Directions: 1. Dispense 3 pumps of product and apply to washed, towel-dried hair. Apply throughout. Use more or less depending on hair length and thickness. 2. Comb through to distribute. Do not rinse out. 3. Blow Dry to activate. Then style as desired. Use each time you wash your hair.